August brings a slew of ways to recognize the importance of breastfeeding. WIC plays a vital role in the promotion and support of breastfeeding. Breastfeeding peer counselors, IBCLCs, lactation consultants, and other lactation professionals help WIC elevate the capacity of breastfeeding to improve health outcomes of moms and babies. August 1-7 is World Breastfeeding Week. The World Alliance of Breastfeeding Action (WABA) has a website to help you mark the week. That website has a social media kit with information, graphics and more that you can use. Another helpful resource is the World Breastfeeding Week Inspiration Guide. To go along with the international commemoration, US Secretary of Agriculture Sonny Perdue proclaimed August 1-7 as National WIC Breastfeeding Week in the US. View the full press release. With the proclamation, the USDA Food and Nutrition Service (FNS) launched a new breastfeeding campaign titled “WIC Breastfeeding Support – Learn Together. Grow Together.” The research-based social marketing campaign encourages moms who participate in WIC to breastfeed their babies and provides them with support and expertise to help them succeed on a new website. NWA is supporting Senator Jeff Merkley (D-OR) and Senator Tammy Duckworth (D-IL), who are leading a Senate resolution, S.Res 605, marking the first week of August as “World Breastfeeding Week” and the month of August as “National Breastfeeding Month.” In addition to honoring World Breastfeeding Week and National Breastfeeding Month, the resolution calls for “support[ing] policies and funding to ensure that all mothers who choose to breastfeed can access a full range of appropriate support from child care and health care institutions, health care insurers, employers, researchers, and government entities.” Please contact your Senators today to ask them to co-sponsor Senate Resolution 605! 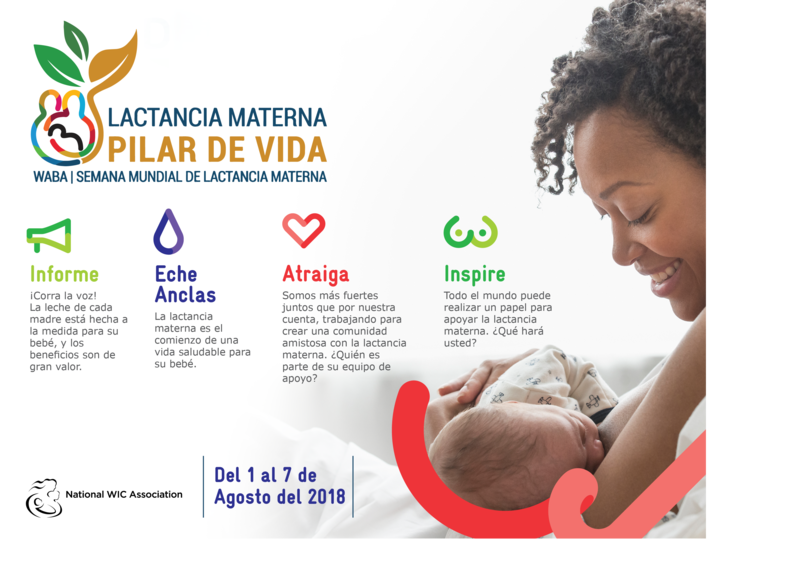 NWA has produced a breastfeeding graphic that can be made into posters or fliers for display in WIC clinics, doctors' offices, bookstores, churches, etc. The graphic is available in English as well as in Spanish. Watch our Twitter and Facebook accounts this week, which will highlight breastfeeding in posts daily. You are welcome to share our posts on your own pages. States that are participating in the National Recruitment and Retention Campaign can utilize the Local Activation Toolkit Facebook posts that promote Breastfeeding and World Breastfeeding Week. These posts are located within the NWA Online Community. Also, don’t forget about our upcoming Nutrition Education and Breastfeeding Promotion Conference and Exhibits on September 25-27 in New Orleans, LA. Haven't registered yet? Register here today. The US Breastfeeding Committee has declared all of August Breastfeeding Month. See USBC’s National Breastfeeding Month Guide. 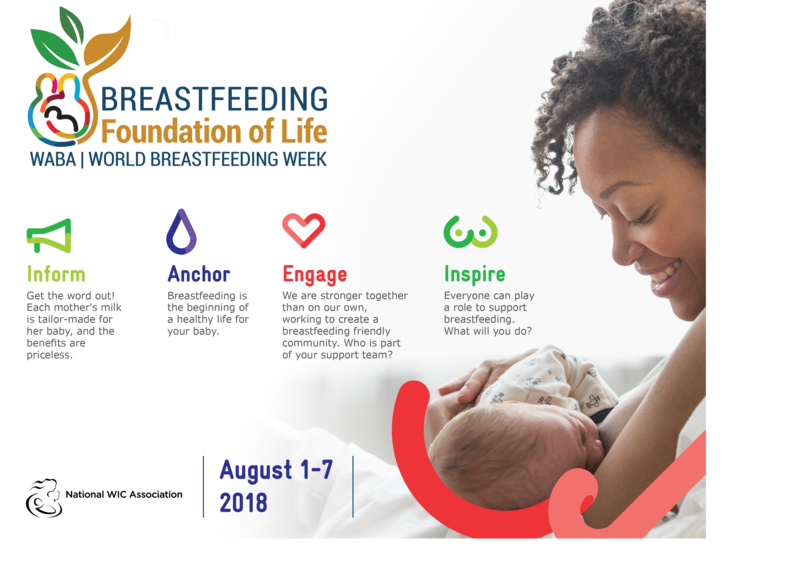 Beyond now, World Breastfeeding Week, you can highlight this topic all month in your communications, ending with Black Breastfeeding Week, August 25-31. To mark Black Breastfeeding Week, NWA has partnered with DC WIC to host an event on Thursday, August 30 from 5 to 7 pm at the R.I.S.E. Demonstration Center in Washington, DC. Attendees will learn about the Black breastfeeding experience firsthand, hear tips and advice from experts, have the ability to ask questions to the panelists, and receive educational materials. To RSVP as an attendee, click here. See the flier for the event, and feel free to promote this event within your own networks. Reach out to Natalie Mulloy at nmulloy@nwica.org or intern@nwica.org if you have any questions. If you’re not able to come, why not host a Black Breastfeeding Week event of your own?